Beware of test pressings they are becoming the new bootleg! Absolutely amazing. Was really not waiting for this to sound so good! Can anyone confirm audio quality on this LP? Source tape? As the LP is? Are you at risk? My copy also has side B with a green label and side A with the Can Can girl. It's Catalogue number K 56011. It also says that it was "Printed and Manufactured by Album Graphics Inc., Printed in U.S.A." Record labels say "Made in U.K."
My version has side b Green WB labels and side A custom "Can Can Girl" label. I believe it is an original press. Can anyone confirm whether or not the release should be updated to reflect this? The version I have has the Cat Nr "K 56011" on the sleeve, but the record label has "WB 56 011". Is this the same version as listed here or did a dealer slip a reissue into the original sleeve? Run out code scratched in on Side A: WEA 40 314, PF and Manufactured in Germany; Side B: BS-2665 - 40315 - 1A. Can anyone help? More fun kinetic album art. The eye sockets and mouth are die-cut with the actual eyes and teeth printed on the piece behind. 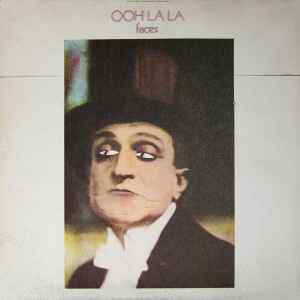 If you take the record out and squeeze the jacket from top to bottom, the funny face changes.